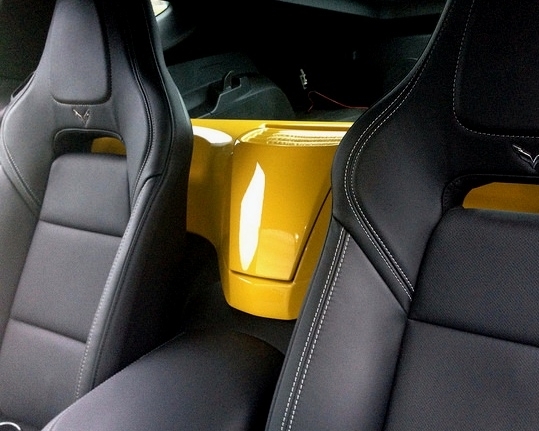 Are you looking for a way to make your C7 Corvette Stingray really stand a part from the rest? Or maybe you take your C7 Corvette to car shows and need "that little thing that puts your Stingray over the top" then Our C7 Corvette waterfall extension is the perfect product for you! This fiberglass waterfall extension is make with a functioning door that will open and close with ease and allow you to store your iPhone, wallet, pens, etc. This C7 Corvette Stingray Waterfall extension is available in the following ways: raw, unpainted, painted any body color and painted any body color with Carbon Flash Metallic center door. Because of the custom nature of this product, please allow 3-4 weeks from order date to ship date.